Yesterday's Person-of-Mystery was Glenn Cunningham. 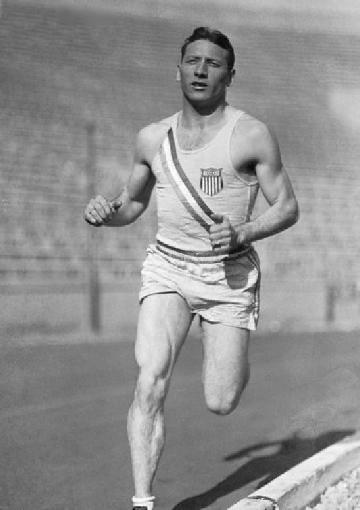 Glenn is perhaps best known as the world record holder for the mile from 1934 to 1937 and winning the silver medal in the 1,500 meter race during the 1936 Berlin Olympics. While his athletic talent is impressive, his life story is even greater. When Glenn was eight years old, he was horribly burned in a schoolhouse fire that took the life of his older brother. Glenn lost all the toes on his left foot and the doctors predicted he would never walk again. Determined to walk, Glenn would throw himself off his wheelchair and pull his body along across the yard and along a fence. 22 months later, he took his first steps and through sheer determination, learned to run despite the pain. He soon discovered he had less pain while running than walking, so he ran nearly everywhere. In high school, he set records for the mile and later attended Kansas University. While at Kansas, he refused all scholarship money preferring to pay his own way. 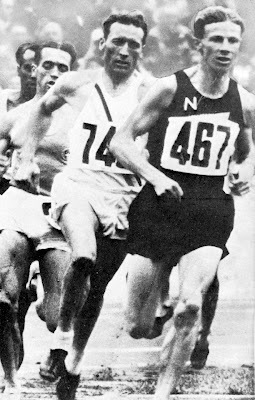 By his sophomore year, he had set Big Six and national records, he also ran the 1,500 meter race at the 1932 Olympics, but finished fourth due to a severe cold. 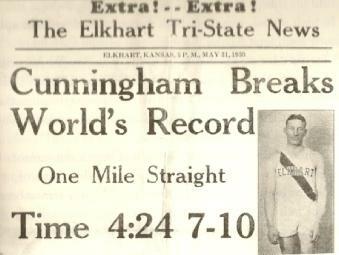 By his senior year, Cunningham had set a world record for the mile of 4:06.7 and held seven of the top 13 fastest recorded times for the mile. 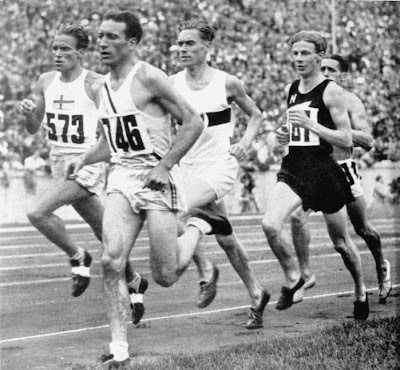 In 1936, he competed in the 1,500 meter race in Berlin, and broke the previous world record, but finished six tenths of a second behind Jack Lovelock from New Zealand (actually the top five finishers in this race all broke the previous world record). He was voted "Most Popular Athlete" by his fellow athletes (Jesse Owens was second most popular). He went on to earn a master's degree from University of Iowa and later a doctorate from New York University. 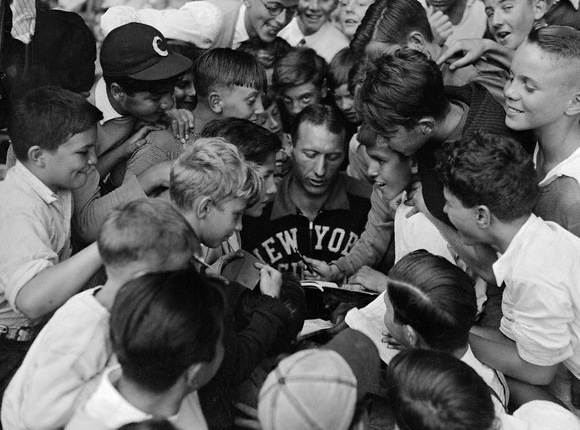 While in New York, he won 21 of 31 races at Madison Square Gardens and set an indoor mile record there in 1938. His fastest mile time was 4:04.4 at a Dartmouth track meet in 1938. When the 1940 Olympics were cancelled, he retired from his running career and taught at Cornell College in Iowa. During World War II, he served two years in the Navy. A sincere Christian, he spent the remainder of his life, speaking publicly about his faith (which is what he was doing in yesterday's photo) and also running the Glenn Cunningham Youth Ranch for troubled kids in Kansas. It is estimated that he and his wife raised around 9,000 kids on their ranch in the years until his death in 1988. Nate, you stumped us all. Thanks for letting us learn about Glen Cunningham. What a great story, would make a great book/movie. Fantastic story! 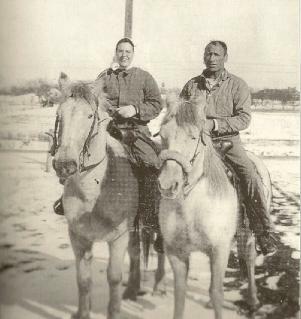 Sometimes I'd love to cross-post some of the history I find out about here so people on other sites can read about these stories (credit given, it should go without saying). Haven't done it, just sounding it out with you, Nate. Post away, Astrocrabpuff. I'm a history teacher. These stories don't come from my imagination, they come from what I've read. :) there are two books...The Kansas Miler and Never Quit! Jennifer, thanks for the comment! You must be very proud of your grandfather. What a life race well run!